There’s a saying among journalists: “If your mother says she loves you, check it out.” It means writers and readers alike should bring a healthy dose of skepticism to news stories. Double-check all facts, figures, and sources — even familiar ones — and if it seems too good to be true, it probably is. In other words, don’t believe everything you read. This is especially important with the recent phenomenon of fake news. You may have been duped by a misleading or fabricated story. Known for spreading like a virus on social media, there is usually a formula to fake news stories. They start with an irresistible, click-bait of a headline that’s meant to stir up an emotion in the reader. The rest of the article is made up of biased premises, slanted statements, and fabricated quotes. The article gets shared among friends with similar viewpoints and the misinformation spreads. What’s a truth-seeking reader to do? There are ways to protect against falling for fake news. First is to seek established news sources with strong journalism standards. Look closely at the originating URL. Does it come from a known and reputable source? Can you easily identify the author of the article and the site owner? Be wary of stories that rely on confidential and unnamed sources. Solid, original reporting will attribute sources to statements, so readers can make their own judgments about credibility. Legitimate news sites employ teams of editors and web designers, so be suspicious if you spot a lot of misspellings and grammatical errors and if the design is overly difficult to navigate. Read a wide variety of news from a range of sources. There’s a good chance the story is fake if no other news outlet is reporting it. Another benefit is you will get a more complete picture about the topic. Communication is a two-way street and the quality of information provided to news sources is vital. As parking professionals in an unpredictable environment, you might become part of the news cycle. IPI’s Media Interview Coaching workshop at the 2017 IPI Conference & Expo in New Orleans will prepare you to confidently state your message and minimize the chance that your words will get taken out of context. Led by an award-winning executive coach, you’ll learn how to respond to challenging questions, craft clear and concise messages, avoid falling into common reporting traps, and leverage solid delivery skills to maximize your parking organization’s message. Be taken more seriously and viewed as a trusted source when you add the parking industry’s leading certifications to your name. Check out IPI’s pre-Conference trainings and become a CAPP, Parksmart Advisor, or Accredited Parking Organization (APO) Site Reviewer. 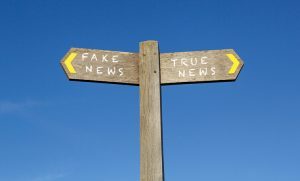 Fake news is a big problem and it’s everyone’s responsibility to be an informed consumer. IPI’s professional development can help keep your parking organization from becoming victim to a bogus story. Thank you Bonnie for your thoughts here they’re very much appreciated and a right on message! It’s sad to see how polorized we’ve become as a Nation but as Parking Professionsals we must continue to be transparent in our communications and if we do mispeak be quick to own it , apologize, and get the right information out. This Is just one teaching moment I learned from one of the best seminars I attended going through CAAP….. and it has served me well over my 25 years in parking administration!